There were a ton of games to focus on in this week’s feature with the Spanish La Liga, German Bundesliga and Italian Serie A all having mid-week action in addition to the clashes this weekend. The likes of Real Madrid dropped shocking points but regained their form on the weekend, while Paris Saint-Germain would have been left disappointed with their goalless draw on the weekend. Manchester City impressed in England and further heightened their title credentials as the Premier League odds suggest and Borussia Dortmund continue to embrace their free-scoring self. Some surprises, some impressive showings and a whole lot of young players to pick from! In goal this week is Espanyol’s Pau Lopez; the 22-year-old was impressive as he kept a clean-sheet away to Villarreal in a commendable 0-0 draw for his side, following that up with another good showing at home to Deportivo La Coruna in a 4-1 win on Sunday. His loan to Spurs may have not been as fruitful as he hoped but he’s certainly trying to make up for lost time this season. Full-backs factory Valencia have another star on their hands as 22-year-old Ignacio Vidal, who made his debut earlier this season, impressed in his side’s 3-2 away win over Real Sociedad. Although defensively still a little suspect, the Spaniard has a clear attacking threat having made a run forward and calmly chipped the keeper to score his first goal for the club. 21-year-old Abdou Diallo has appeared in this feature last season while playing for Monaco, and he’s looking to build on that early impression with good showings for new side Mainz. 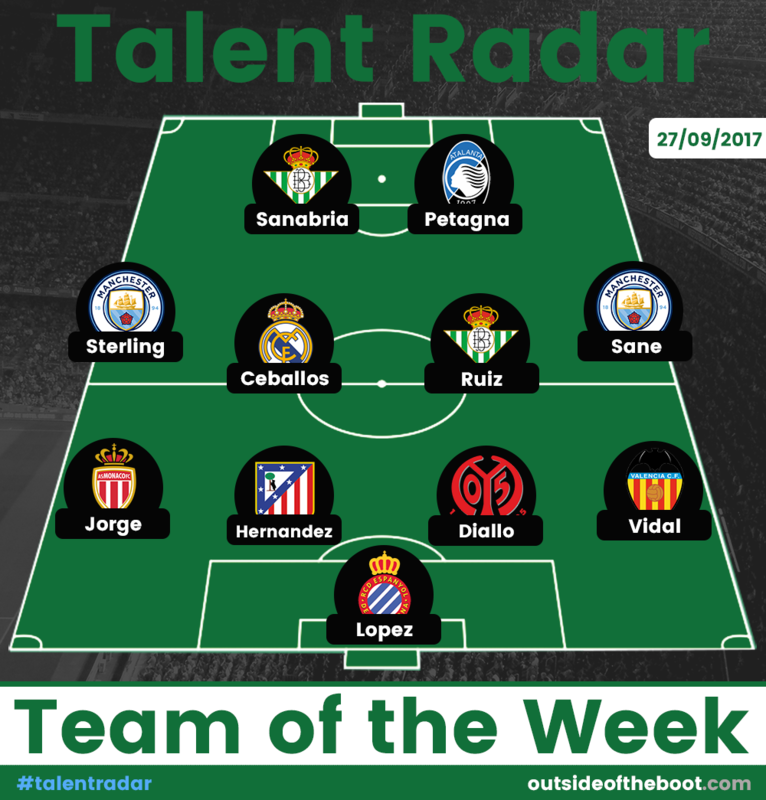 His defensive performances in a 1-0 home win over Hertha Berlin secured his spot in this week’s team. Partnering him is Atletico Madrid’s French central defender, Lucas Hernandez. The 21-year-old has taken the chances presented to him at Atleti this season, with others absent, and put on another Simeone-typical defensive performance in the 2-0 win over Sevilla. At left-back is Monaco’s Brazilian – Jorge. The 21-year-old ha started and completed every league and Champions League match for the defending French champions and has fit right into Monaco’s attack-oriented setup. Another good showing in a 4-0 win away to Lille followed this weekend. 21-year-old Fabian Ruiz is in central midfield after a memorable performance in the heart of the Real Betis’ midfield as his side not only got a famous victory at the Santiago Bernabeu, but also did what no side across Europe was able to do for the past seventy-three games – prevent Real from scoring. The Spaniard no doubt had to put in a passionate shift in midfield. He followed that up with an excellent performance against Levante in a 4-0 win, scoring one and setting up another. Joining him in midfield is Real Madrid’s Dani Ceballos, who scored twice on the weekend to help his side to a much needed 2-1 win over Deportivo Alaves. A first half brace equaled Ceballos’ scoring record for a season, and there’s no doubt that there’s more to come from the Spanish midfielder. On either wing is Manchester City’s attacking duo of Raheem Sterling and Leroy Sane. 22-year-old Sterling scored twice while his German team-mate set-up two and got one for himself with some fantastic work in the box to help the home side to a comfortable 5-0 win over Crystal Palace. Up front is Atalanta’s Andrea Petagna who scored one and assisted another as his side emerged 5-1 victors over Crotone. The Italian, having truly broken onto the scene last season, realises how important a season this could be for him. Partnering him is Antonio Sanabria, who scored that famous late winner for Real Betis at the Bernabeu with a perfect header, and followed up this a brace on the weekend against Levante in the 4-0 win. As memorable weeks come, not too many will be better than what Sanabria experienced.